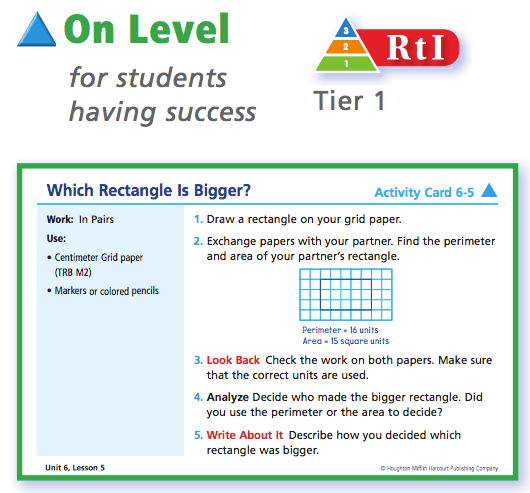 Day 5: Three Experiences to Help Students Uncover Foundational Area and Perimeter Relationships (The Perimeter Stays the Same, The Area Stays the Same, Perimeter with Cuisenaire Rods) *Exploration* - good opportunity for students to wonder and pursue answers. 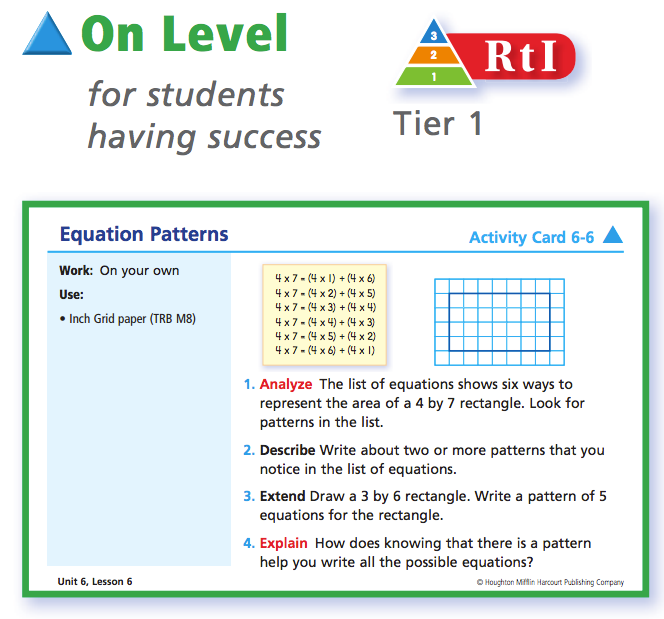 Any or all of the Student Activity Book pages will provide evidence of student understanding of the concept of area. You could select any item from the pages to be an exit ticket. • Paper Draw or cut out a 5-inch by 7-inch rectangle. Session 2.2: Which Tetrominoes Fit? This is a pretty direct lesson. Students get more practice with area by counting squares within figures sketched on dot grid paper and by tiling rectangles. Adding Geoboards to the dot paper activities would make it more engaging! 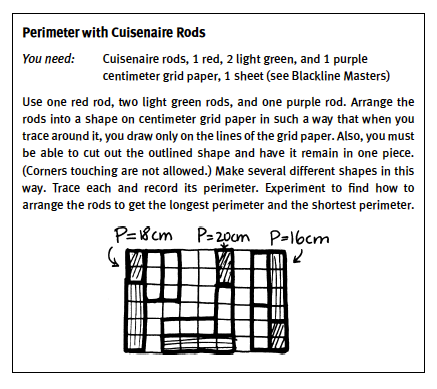 Perimeter is also introduced in this lesson. 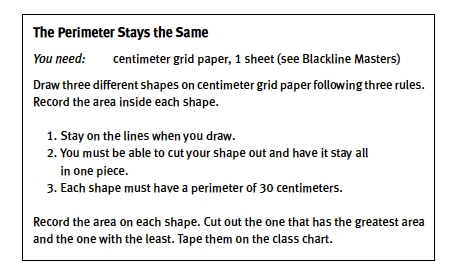 1) Recognize perimeter and area as attributes of plane figures and find perimeters and areas of figures on a dot grid. 2) Measure area by tiling with unit squares and by multiplying. 3) Measure areas by counting square feet and square meters. Collect SAB p. 336. Do students understand what perimeter and area mean? Are they using correct units? Are they accurate? 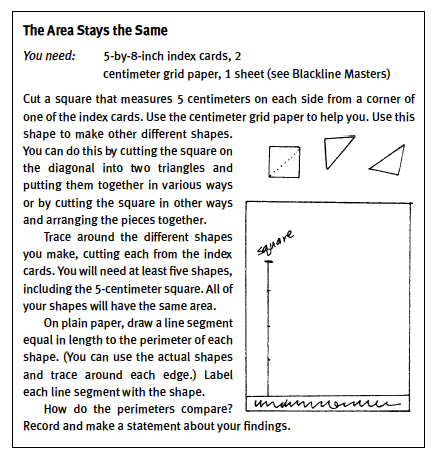 (from Sizing Up Measurement: Activities for Grades 3-5 Classrooms by Chris Confer, p. 68-72) - click on the file to the right for the "Full Lesson Description"
In this lesson students develop the ability to decompose areas as they design a hallway for a tile company. An imaginary home owner wants the tiles in her 4-by-6-foot hallway to be arranged in two rectangles, one red and the other blue. The students record their designs on grid paper and write equations to describe the smaller rectangular areas within the large rectangle. Then students write a note to the homeowner explaining which arrangement they recommend. Decompose a larger rectangle into smaller rectangles and write the expression to match. of (d x e) and (d x f). Activity 2: Find an unknown side length of a rectangle when one side length and either the perimeter or area are known. 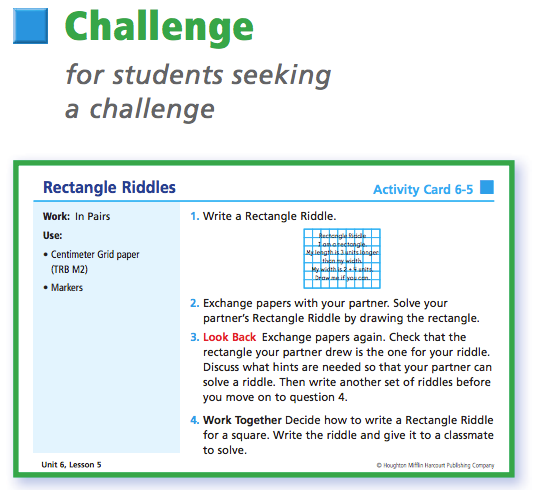 Pick a problem from the Student Activity Book pages to use as an exit slip. What happens to the area when the perimeter stays the same but the shape changes? What happens to the perimeter when the area stays the same but the shape changes?